R.D. “Denny” Erpelding is shown in this photo with an orphan boy nicknamed “Monkey” who used to hang around CAP 2-7-2. We fed him and provided him with clothes and small sums of money. He is wearing a child-size set of Marine utilities we had tailor made for him. 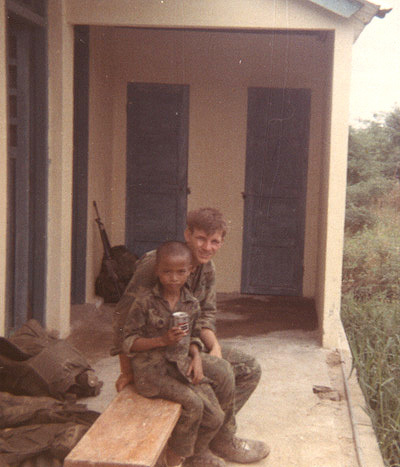 I believe Monkey is the same as a kid named “Cho” who hung around the Marines of CAP Delta 1 in 1968. The resemblance is unmistakable and like Monkey, Tom Harvey of Delta 1 says “Cho” was “slow.” Tom met Cho again when he returned to Thanh Quit in 1989.